In the midst of our toughest battles, our biggest losses, God is at work. He enters into the chaos, and instead of allowing that pain to be the end of our story, He makes miracles. All it takes is a little hope, and a lot of fight. Waiting for her next turn, junior Stacy Rohan looks down Spartan Field as her teammates continue a cross-field passing drill. 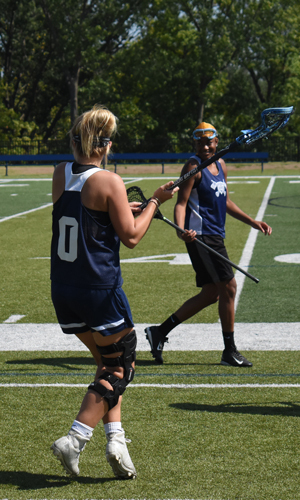 Rohan returned to the game this fall after suffering an ACL tear in October 2017 and learning what it means to be a teammate from the sidelines. As an athlete, most of my life has been defined by performance. My stats, my accolades. My childhood soccer team went undefeated for nearly 10 years (with little thanks to me), so complacency founded my athletic career. High school lacrosse changed that for me as I found myself much more passionate and serious about lacrosse than I had ever been playing soccer, basketball or volleyball, but somewhere within those four years, I developed the opposite problem: chasing perfectionism. Two of my good friends at the time — the three of us made the junior varsity team our freshman year — joined a club lacrosse league to train with throughout the summer, and although I had chosen to leave my basketball and volleyball days behind and solely pursue lacrosse, a club team wasn’t in the cards for me financially. After wasting time sulking in sorrow and bitterness, I took matters into my own hands. The summer before 10th grade, I spent every day outside, playing wall ball, working on my shooting and bettering my stick skills however I could. I was determined not to let my friends surpass me in the upcoming season. Sophomore year, I made the varsity team, and I knew I was still in the running to be the best, eventually. I take pride in my pursuit, but my inspiration was fleeting, and my motives were selfish as I was focused primarily on outworking my friends in order to be seen by my coach. I received the Best Offensive Player and Most Valuable Player awards after my junior season, and Best Offensive Player again my senior year. I could expand and make this story in itself one of those coming-of-age stories, but that’s not what happened here. Just before 11th grade, I accepted Christ after attending my first Fellowship of Christian Athletes camp, where I was introduced to the idea of competing for Him, and though this absolutely began to shift my mindset on the field, my identity remained in my performance. Until October of 2017, my sophomore season at MBU, I thought I had it figured out. I thought I understood that my identity was in the Lord, thought I was competing accordingly, but complacency had just resurfaced. One night in late September, I prayed that God would use me. I prayed that whatever He needed to do in order to further pursue His plan for my life and bring Him the glory He deserves, that His will would be done. Days later, my prayer was answered. I tore my ACL, ending my season before it began and removing me from the game I loved for an entire year. It’s not often we’re able to identify our tragedies as answered prayers, and this was no different. The day I tore my ACL was the day my life shifted, the day I entered a season where my faith would be tested. 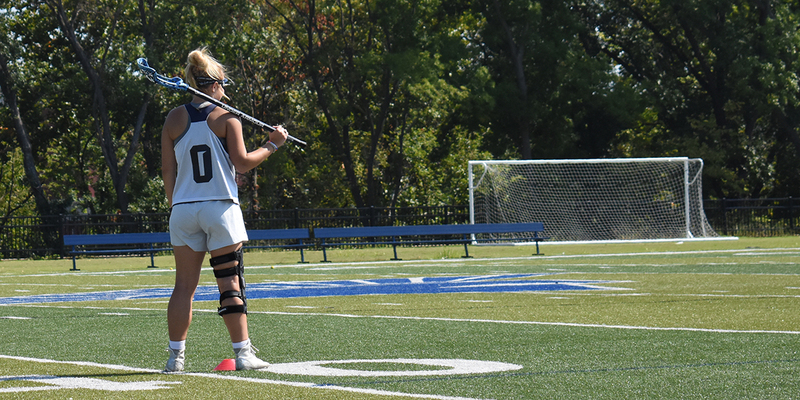 I was so consumed by my passion for lacrosse that it took a season-ending injury to wake me up and quite literally force me to take a step back. I mourned the loss of my season like I had lost a loved one. I’ve been lucky enough in my life up to this point to have little experience with grief, but this only made it harder to accept such a sudden, significant loss. My list of plans and expectations for the season were stripped away from me in the split moment it took for the ligament to snap in two. So, I cried til my eyes ran out of water. I asked, “Why me?” multiple times, not understanding why God let this happen when I had been working so hard. I underwent surgery, experienced crutches (and not being able to bathe on my own … talk about a loss of dignity) for the first time and prepared to watch my season carry on as I sat on the outside looking in. I faced doubt, pain and a loneliness I had never experienced before. I questioned whether I deserved to keep my title as a captain since I could no longer contribute on the field. The thing that got me through each day, gone. The thing that kept me motivated and fueled my confidence, gone. I felt I had lost my identity. In the midst of all of this, I held firmly to the hope that God wrote this chapter in the story of my life for a reason, and although it didn’t minimize the pain, it gave me hope. And sometimes, hope is enough. The hope that someway, somehow, the heartache will be worth it. So I did what I had to do. I put my feelings aside and I showed up, every day, wobbling around the practice field to stay next to and encourage my teammates. Once I could walk, I shagged balls and filled waters. I kept my stick in my hand at all times and played wall ball (while sitting in a chair per coach’s request) any chance I had. I sought advice from mentors and prayed each night that God would give me the strength to hold myself together through the next day. Some days were better than others. I tried my best to exert the energy I could no longer release through my own physical efforts into my teammates, offering to go over plays with them or offer specific feedback. I spent 10 months in physical therapy, which was dehumanizing at first, but my coach and therapists taught me to celebrate the little victories as big ones. Learning to find excitement in lifting my leg on my own or reaching full extension was just a glimpse of the many ways God helped me grow through this journey. For the first time, I found myself capable of fighting off the bad thoughts. I learned how to be a teammate from the sidelines, how to serve my team from a new perspective and how to appreciate things we often take for granted, like running. The day I tore my ACL was the day I received an offer to coach at Westminster Christian Academy. Through coaching, I was able to take the time I’d usually spend reflecting on my own lacrosse progress and spend it planning practices and investing in each young athlete. I connected with and encouraged the injured players, particularly the one who was out with a season-ending injury herself. I clung to verses like Esther 4:14: “Perhaps this is the moment for which you have been created,” and I prayed that God would reveal to me more of the goodness He had in store. This summer, I led a group of high school students at an FCA camp, and I was in awe of God as I found that most of my huddle members had experienced serious sports-related injuries as well. I was given the opportunity to share my story and connect with the kids in ways I wouldn’t have been able to just a year before. While at camp, God did an awesome thing: He reassured me, with an overwhelming sense of peace and thankfulness, that my identity truly does reside in Him. Ten months post-op, I thanked God that I tore my ACL, and I meant it. I’m reminded nearly every day that God has used this hardship and will continue to do so. I reflect and notice blessings that I didn’t notice along the way, like the fact that my new coach could so closely relate and would walk alongside me through some of the toughest months of my life. A few weeks ago, I was fully released to play lacrosse. Practices have begun. Simply look at the Lord’s timing. Undefeated seasons, awards, these things don’t matter, not really. We can only achieve so much when working out of our own will, only find so much satisfaction in worldly praise. I’m ready to enter a lacrosse season founded on the gratefulness in my heart for having legs that run and a God that provides, a season in which fear and the pursuit of perfection have no place. Philippians 4:6 tells us to make our requests known to God, so I pray and ask Him to keep me injury-free moving forward in my lacrosse career. But I also pray, once again, that His will be done. Whether I tear my ACL again or have the best season of my life, my trust is in the plan He sees through the lens above. So I leave you with this: If God’s plan for your life looks different than your plan for your life, do you trust that it’s still better?